Craig was fortunate to be exposed to American Sign Language (ASL) at a young age. He grew up with Deaf friends and found his way in the Deaf and signing communities thanks to the nurturing of many incredible Deaf people. Thanks to these gifts and his native-like fluency Craig has been able to create and star in an ASL/English comedy web series, take the stage at Shakespeare in the Park's Delacorte Theater, tour the country performing, play characters with various levels of signing proficency in award winning films, interpret Broadway shows, and much more! When he's not working as an actor, Craig has the privilege of working as a nationally certified interpreter with Deaf artists on sets, in rehearsal rooms, production/design meetings, auditions, and beyond. Craig took the stage of New York City's celebrated Shakespeare in the Park to sign in Shaina Taub's musical adaptation with New York Deaf Theatre. Craig has a featured role in this beautiful film by Andrew Keenan-Bolger and Adam Wachter that has won awards in festivals across the country and around the globe. He had the pleasure of collaborating with rising stars John McGinty and Alexandria Wailes, household names in the #DeafTalent community. Groundbreaking New Comedy Web Series, "Don't Shoot the Messenger"
Craig stars in this new web series that has over 1,500 subscribers and 46,000 views on YouTube. This show is written, directed, and produced by Deaf people and stars many talented Deaf actors. Craig plays an awkward, but loveable sign language interpreter who, despite being fluent in ASL and English, constanstatly misunderstands, misinterprets, and misreads people and situations. 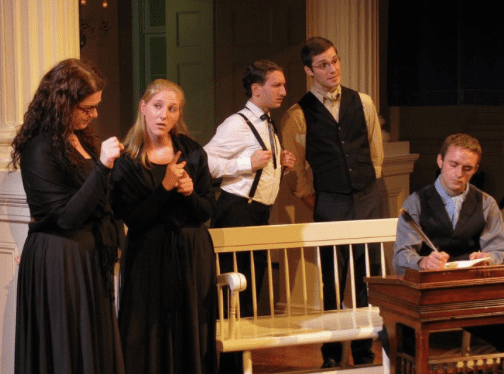 Craig was in the original workshops and the first production of the original play "Journeys of Identity" created by National Theatre of the Deaf at the Eugene O'Neill Theater Center. Craig understudied both brothers, Daniel and Billy in this play about a Deaf boy finding his voice in his noisy family. Craig toured the country leading the company of this ASL/English adaptation of the popular tale of Charlie Bucket and the golden ticket. Craig has interprted countless shows on Broadawy (School of Rock, Something Rotten), off-Broadway (Atlantic, New Victory), regionally (Paper Mill), in concert venues (54 Below), and beyond. He enjoys being a part of interpreting teams that allow Deaf and hearing families and friends to experience the magic of theater together.